FictionFriday started out as this fun challenge for myself, but turned into something more. I used to choose four quotes from different books and turned them into a new story, now it’s all about finding inspiration in different places. It’s no longer the quotes that inspire me, but it’s life (I know that is probably the cheesiest thing I have ever said)! This week I was inspired by this post on Facebook. It was a post about 23 emotions everyone feels, but no one can explain. I ended up with eight six-word stories (remember those? 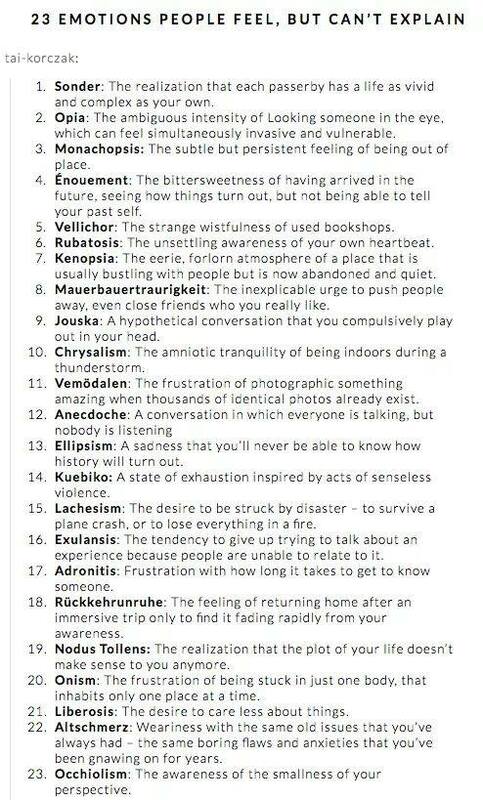 ), that for me somehow do explain at least eight of these emotions. I know you can’t really read any of it, but just click the image. Six-word story: Everyone somehow connected, destined to die. Six-word story: Looking, but no one is there. Six-word Story: You and me, yet still alone. Six-word Story: Beating to live, unable to win. Six-word story: Left in the dark, anyone there? Six-word story: Love is kindness, kindness is lost. Six-word story: Words everywhere, no way to explain. Six-word story: Endless universe, no way to understand. That’s it. Maybe have some fun and try to make your own six-word story.